Anna said the cutest thing yesterday. She said she doesn't want Addie to get bigger because she really likes her small. Well, I couldn't agree more. Adelyn is such a sweet kid, with an amazing imagination. I like to joke that some days I don't bother to even get her dressed; I just send her to the basement (playroom) to pick out a dress up outfit. She loves her baby doll "Fee" (short for Sofia), and her kitty named Lucy (after the Pasternak's cat). She carries them around all of the time with her. She also loves to put on dance shows and she uses the get-in-shape-girl inspired ribbon that I posted about here. Today is Adelyn's third birthday and we will be celebrating at her school, the park, and then our house. It is going to be a crazy day! Bill and I will be serving cupcakes and reading her class a story. Her school allows you to bake cupcakes (which we have never been able to do before). 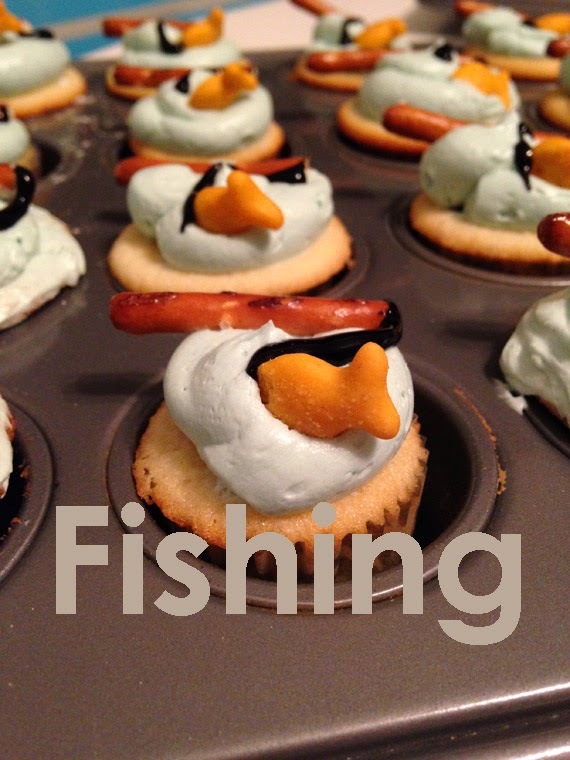 I showed her some pictures of cupcakes and she chose these fishing cupcakes. Her and her sister love to go fishing with their grandpa (Poppy) so these seemed perfect. Sarah came over last night to help me decorate them. Addie has requested macaroni and cheese for her birthday dinner (this doesn't usually fly, but it's her birthday). Her birthday party is in a few weeks. She knows about her party, but has requested a surprise party, so we will see how we can pull that off.